I've always seen Nip + Fab products about but sometimes with hype it leaves me wondering if I dare try to be left disappointed. Ever get that feeling? Until about November, had a face incident which led me looking for anything that would give my face a higher exfoliation turnover. As Nip + Fab was on sale I decided to try their glycolic range, first being their glycolic fix pads night time and between me and you - since using them I've had one spot but I digress. I liked the range so much so that when ASOS said they had some exclusives from Nip + Fab and I spotted the word GLYCOLIC. I said hell yes, come to mama. 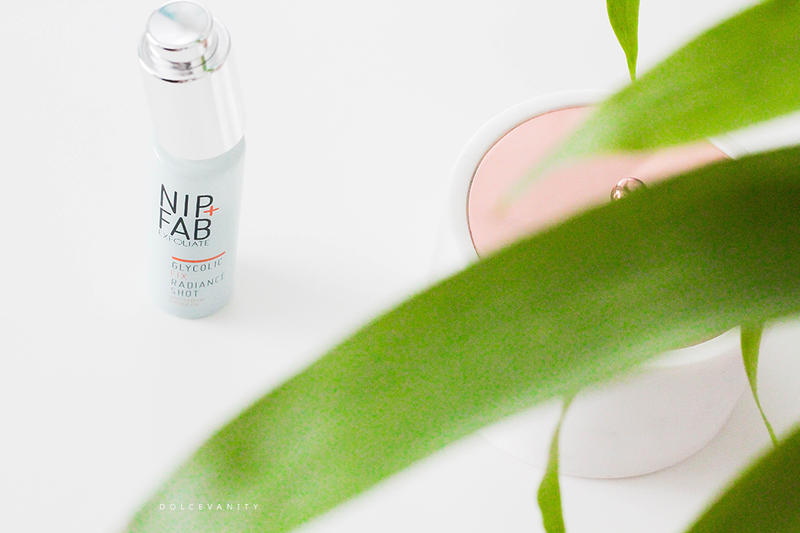 Nip + Fab say it's a lightweight moisturiser, that is designed to hydrate and protect the skin while it's oil-free formula helps to control shine. Now, I use this either twice or once a day, if it's once then it'll be at night to coincide with the night pads. What I like about this serum - besides the fact it's glycolic acid - is the packaging. The lid contains a click - smart. So before use I click once to get the product within the dropper and unscrew, click to release onto the back of my hand, two drops are more than enough and then apply to my face. Sometimes I apply it to my moisturiser. The product has a pearlescent blue tint, then once applied on the face it gives such a golden hue letting it look brighter and more radiant - so it's a pretty good product to use in the morning if you want a glow that's actively helping target skin concerns. I experienced no tingling or irritation - which is good. It's so far a nice aid to my regime that includes a lot of active products that are encouraging my skin to get even and keep even. + please, let's remember our sunscreen even more so when you're using acid concentrated products. It'll help to protect your face as well as stop dark marks getting darker and you won't see any progress. 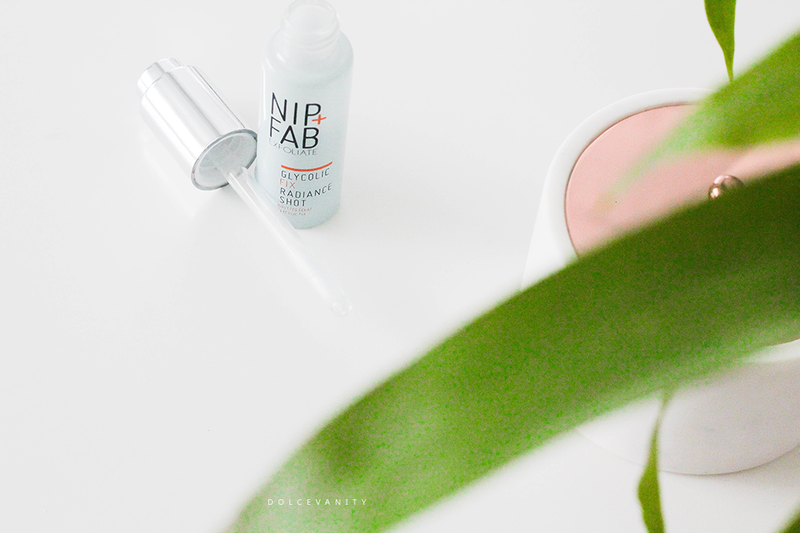 Have you tried anything from Nip + Fab? i haven't tried their products, but it's so similar; must be the packaging! or maybe i've tried a sample from a beauty box? can't remember! either way you made me want to try it, i'm looking for a new moisturiser. i love how it's a dinky bottle too. I've heard so many good things about this brand but I'm still yet to try anything. I think this would be great for my skin. I agree, Nip n Fab are one of the rare brands that actually live up to their hype. I love the sound of this radiance shot. This sounds amazing, I'll have to try it! I've never heard of this brand, thanks for introducing me to it, it sounds so cool! I've not tried any of their products but I really do need a good glycolic acid product. I have some dark spots that have started cropping up and need a good product that will work. I haven't tried their products but seems good product. would love to give it a try. I've heard good things about them and am definitely tempted to pick up some of their products now. I tried the nip and fab pads.. then moved on to the nip and fab wash.. then the nip and fab moisturisers... then the serums. Basically I'm a nip and fab everything kinda girl now. The full range is the nuts! I'm a big fan of products containing Glycolic acid, it really works for brightening up my skin. Nip and Fab have some awesome products! This serum sounds great!! I love that a leaves a subtle glow to the skin too and that it feels good on the skin with no irritation! I really like Nip and Fab, their CC cream is really good and I love the Glycolic pads too. I've heard of this brand, but never heard of this product before. It sounds great! This is a very unique product and I'd love to add to my daily routine! No I haven't but I would love to. Sounds fab. My mummy could do with that glow first thing in the morning! Sounds like a great product! Never heard of anything like this before but it sounds like a handy little addition to any daily routine! Definitely something I need for my skin! I too like many others not tried these products although I love reading about them all.